Is there any way to re-use blood glucose test strips? 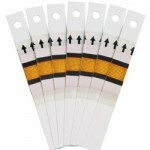 How to measure your blood glucose if you ran out of strips? Interesting blog post on the subject.